Have you ever seen a field filled with parents and their kids -- all hopping? That was the scene at the Imagination Movers' triumphant hometown show at this year's New Orleans Jazz & Heritage Festival, and it's similar to the scene that plays out in living rooms across the country when viewers tune into the Imagination Movers' hit Disney Channel series. Fans of the Imagination Movers have one more reason to bounce, pogo and hop, now that the smart kid-pop quartet has released its newest CD For Those About to Hop nationwide on July 7. The Movers -- Rich Collins, Scott Durbin, Dave Poche, and Scott "Smitty" Smith -- formed in 2003 when a group of New Orleans friends started writing songs together and testing them out on their own kids. The band's dynamic, high-energy shows and wide-ranging pop sensibilities (with a special nod to 1980s alt rock) made them an immediate hit at the local parks and children's museums. Not even losing homes to Hurricane Katrina (during which Smitty served as a first responder) scuttled their dreams. After signing to Disney, the Movers released their label debut Juice Box Heroes in March 2008, and are now currently working on the second season of their Playhouse Disney (Disney Channel’s learning-based programming block for preschoolers) show. Since its release, Juice Box Heroes has consistently ranked in the Top 10 on iTunes Children's Music chart. National recognition includes a Parenting Magazine "Parenting Pick," and Common Sense Media recently recognized the Imagination Movers among the Best TV of 2008, citing the quartet's "addictive sense of humor and quest for fun." These qualities are in full display on For Those About to Hop. With a quick wink at AC/DC in the title, the Movers keep their fans on their feet throughout the generous 22-song set. Show favorite "Jungle Room" is a swinging, horn-drenched musical safari, while tunes like "Now We’re Cooking," "Paint the Day Away" and "Playing Catch" are equal parts funk, hip-hop and sing-along rock, with infectious beats and typically catchy lyrics that celebrate learning, growing and fun. Fans of the show will recognize set pieces from the Movers' brainstorming adventures in the Idea Warehouse, but these songs all stand on their own as bright, finely crafted kid pop tunes. A special release of For Those About to Hop is currently available at Target stores nationwide and includes five bonus tracks. An exclusive iTunes version of the release offers another set of five bonus songs and is available this week. All versions include downloadable lyrics and a coloring sheet, along with an interactive game featuring the TV show's popular puppet character Warehouse Mouse. We have one (1) copy of For Those About to Hop to give away to one lucky reader. * Leave us a comment letting us know if your kids love the Imagination Movers, or what your favorite song on the new album is (MP3 widget is above). This contest ends Wednesday, July 22nd at 11:59pm (pdst) so don't wait - make sure you've gotten all seven entries! Please note: entries received after the cutoff time will be deleted prior to drawing a winner. We watch them on the weekends. My kids are glued to the tv when they come on. It would be great to have this in the car to listen to. I like Now We're Cooking. We like the Boom Boom Song! The kids love them! Thanks! 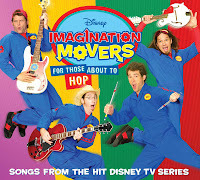 I have to admit that both my daughter and I love watching Imagination Movers and dancing to their songs. Both my boys love the Imagination Movers. We watch them all the time. Holt loves Get Up and I do too. I like anything that wears him out. This group has ENERGY! My favorite song is "Paint the Day Away." I became a Facebook fan, my username is Marcia Scurfield. My kids love watching them on tv. I never sat down to watch the imagination movers until a few weeks ago. Never even new about them until my daughter was watching them the other day. I asked her who they was and she went into details. Would love to win this for her. Stir it Up is our favorite song on the new CD. My daughter loves them! Thanks for the chance! Im a fan on facebook! Sheila H.
I love Recipe (Stir It Up)!